Having the skewers up off the flames was a huge benefit to this kabob set. Here at our house, we have almost made it all the way through all of the first week of school craziness! We did all the last minute shopping and appointments for the dentist, eye doctor, orthodontist and whatever else needed checking before school started last week, and now we have just about finished up this first week for all of the kids. It was a busy couple of weeks, and Don’s school district started a whole week before our kids did, so it’s been a tiny bit hectic! Thankfully, we have some great go-to meals that are fast and easy to prepare, and they’re great for this time of year. Kabobs are one of our favorite things to do in the summer especially, because we love the mix of meat and grilled veggies, and they’re fun to eat! You can marinate them or just cook them as is, and either way they are fantastic! 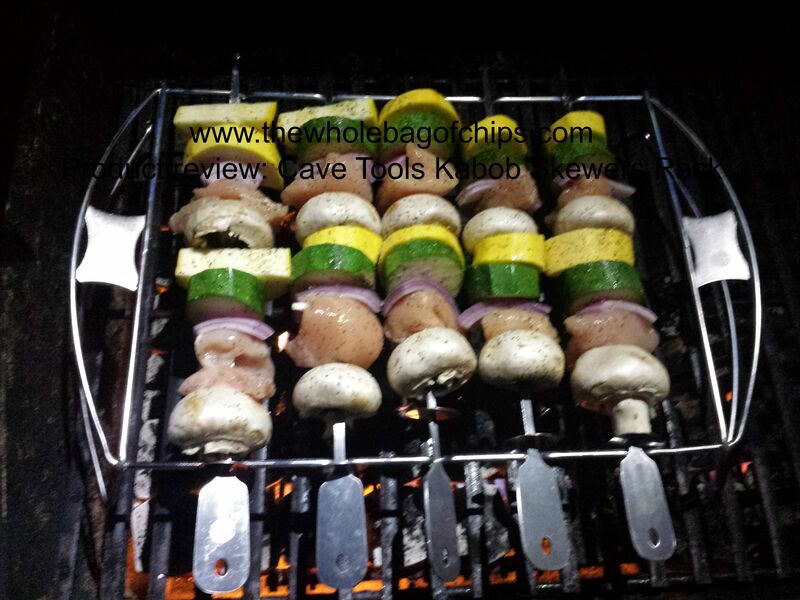 Recently I had the opportunity to try out another Cave Tools product, and since we loved their BBQ set over the summer, we couldn’t wait to see what their Kabob Skewers Rack had in store for us! Prior to getting the Kabob Skewers Rack, we would use wooden skewers whenever we do kabobs, and it’s frustrating to have the meat sliding off the stick as we’re trying to cook them, and it’s hard to slide the meat off the stick once it’s cooked on there. Additionally, it’s very hard to get them evenly cooked, as they sit right on top of the grill grates. 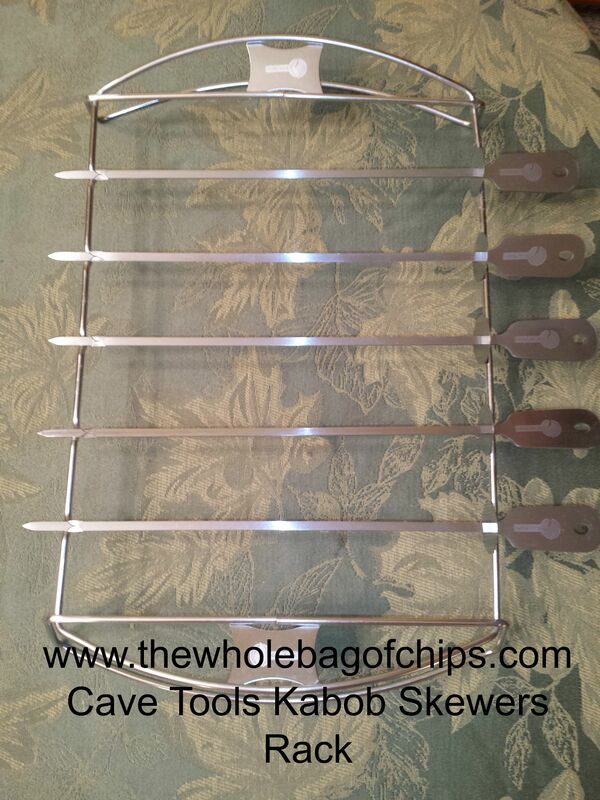 This very affordable Cave Tools Kabob Skewers Rack had features and benefits that would ease our kabob cooking frustrations and we were anxious to try it out. I was thrilled to find out that it’s completely dishwasher safe, and it comes with a Lifetime Satisfaction Guarantee. I love companies that stand behind their products. I also love companies that include recipes with their products and this product came with 25 recipes to try! Don was anxious to try out the rack on the grill, and he was really pleased with the fact that the meat was not directly on the grill grates, thanks to the rack that keeps them just the right distance off the grates yet provides a great finished cooked product. He said it was the best, most evenly cooked meat he’s ever done on the grill, thanks to the rack. The set comes with five flat skewers, which is perfect for our family of five, since everything seems to always come in a four-pack, everywhere we go. The skewers each have a little disc on them which can be used to slide your meat right off the skewer and onto the plate. That was ultra convenient! Each skewer also has a locking mechanism to keep it in place, which was great and tricky at the same time. It was great because the skewers didn’t slide around or come off of the rack while cooking, but a little bit tricky because they get hot and to unlock them to turn them for one of the eight cooking positions was a little bit tough. However, with a set of tongs and a potholder, it can be done, and the even grilling made it worth it. If I could make one recommendation about the product it would be that we wished it came with some sort of dish or tray that the rack would fit onto for setting up the kabobs and carrying them out of the house and to the grill. We ended up finding a Pyrex glass dish that was the perfect size so that the handles of the rack fit on the handles of the dish and the chicken juice could drip down into the Pyrex without the food sitting in it or having anything dripping onto the floor as we carried the food outside. At such a busy time of year, this set made a quick meal even better, and I can see us getting a lot of use out of the Cave Tools Kabob Skewers Rack in the future. So far, we are big fans of the Cave Tools products! I hope that you’ll check out their site to see all that they have to offer. If you are a fan of using Amazon to order your products, you can find the Cave Tools Kabob Skewers Rack there as well! Enjoy the rest of the week and this upcoming long weekend! Got a future engineer? 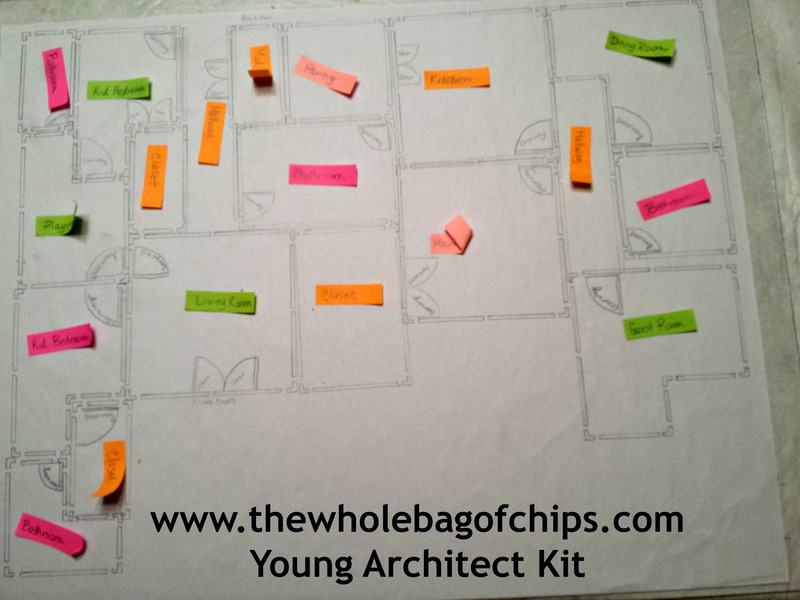 Try the Young Architect kit! I spent much of last month discussing many of the STEAM-focused gifts my girls received for Christmas, but there was one that I held off reviewing because although we’d opened it and played with it, it’s not a one-and-done type of project. It’s something that takes some time, and as my nine year-old daughter worked on it, I watched her and took pictures, but I wanted the project to be more complete than not, when I shared it in a blog post. We’re finally getting to that point where she’s almost done, not 100%, but enough where I can share it and you can get the whole picture. 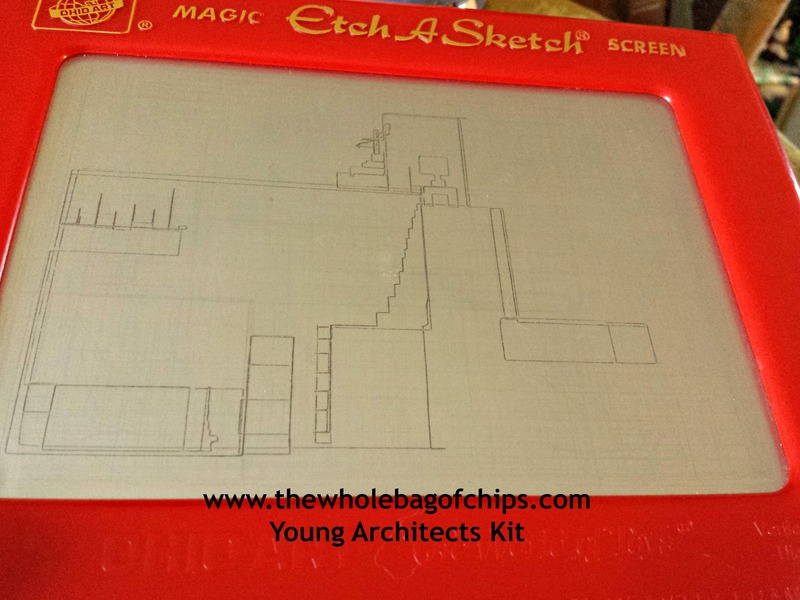 After watching our nine year-old do some pretty complex house plans on the old Etch-a-Sketch toy, it was clear she was ready for the next step. 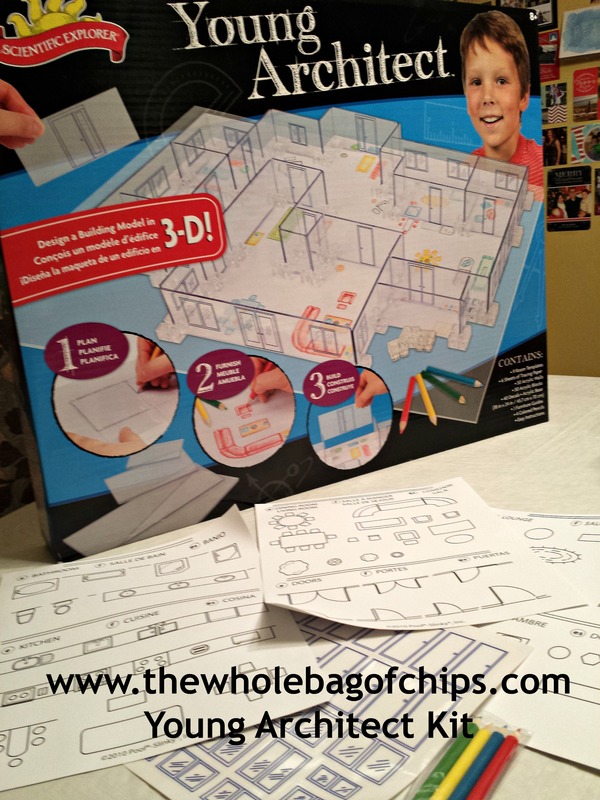 This kit includes everything you need to go from a paper design to a 3D design. 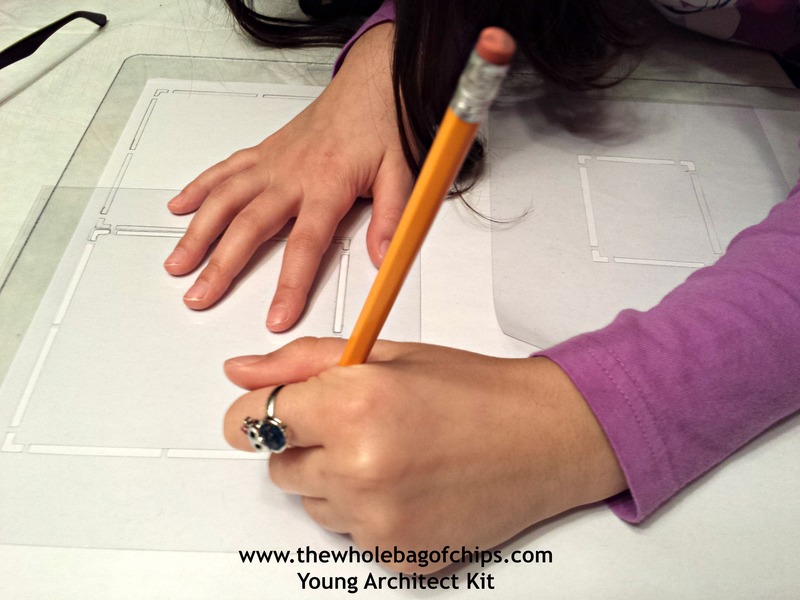 In November last year, as the girls were making their Santa lists, our daughter found a similar kit in a magazine catalog to the Alex brand Scientific Explorer Young Architects kit pictured here, and she put it on her list. At the time, it could be found for $55 on the Walmart website, and ran about $75 in the other catalog where she first saw it. Watching and listening to the thought process and problem solving that goes into these house plans was amazing. 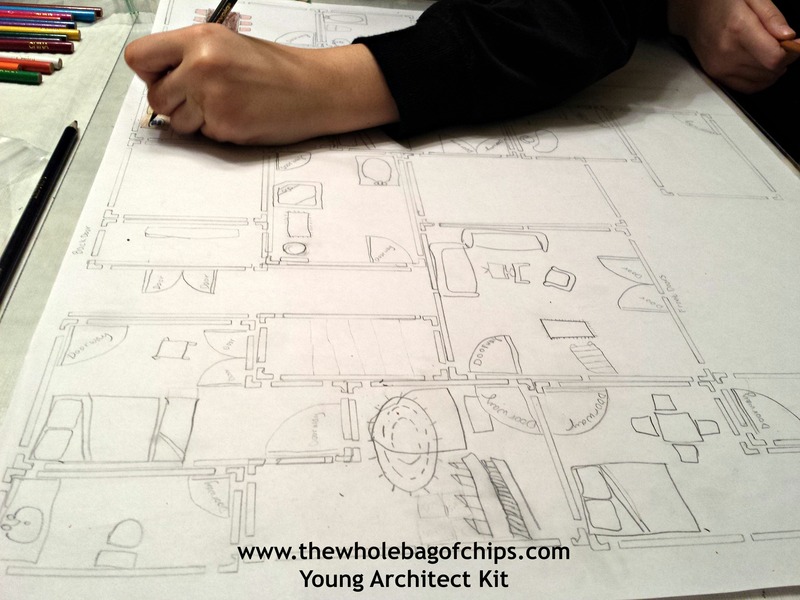 The kit came with everything she’d need to create a blueprint house design on paper, fill it with furniture and then add walls, windows and doors using plexiglass fixtures, creating an entire 3D house plan. It was very exciting when she opened it on Christmas morning. She was so thrilled and could not wait to get started. It was fascinating to watch the project go from its beginning stages of using stencils to outline the rooms to the more complex stages. working, using the stencils to lay out her walls and determine what spaces would be which kinds of rooms. That alone, took some time. It was fascinating for me to be a fly on the wall, watching her figure things out, thinking out loud and problem solving as she went along. She worked for hours at a time, several nights in a row, until she had all the rooms drawn out. She asked me for little post it-notes to label each room so she wouldn’t forget what was what when it came time to add in furniture. Picturing the doors for each room as a little half circle was a little confusing for her, so we went into our bedrooms and I showed her how the doors made the half circle marks on the rugs, which on paper would indicate where an actual door would be, and then she got it, adding them in and figuring out in which direction they opened and closed in or out of a room. The kit has absolutely everything she needs to create a very comprehensive house plan. 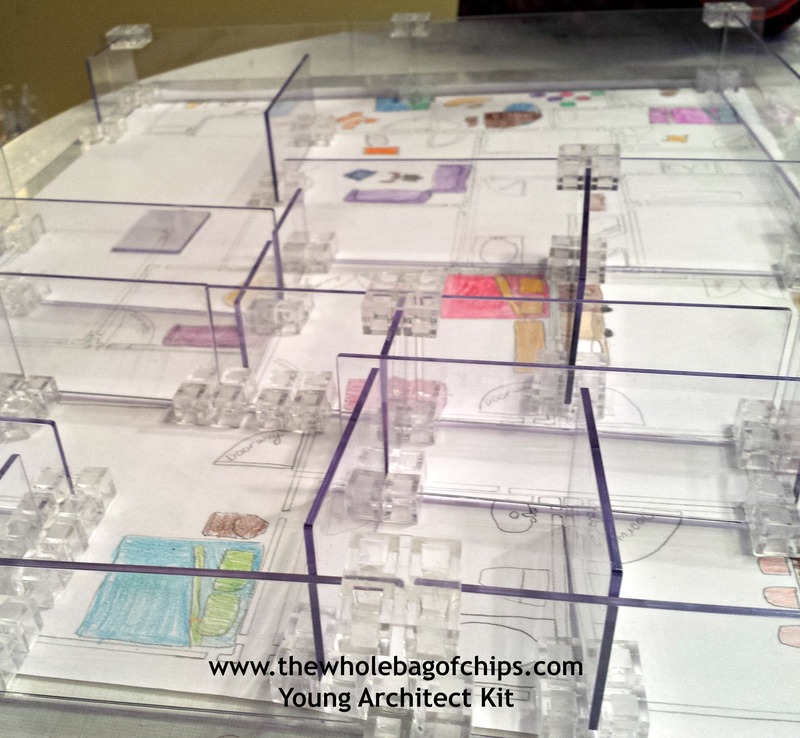 The kit included a plexiglass table-top board, extra-large pieces of tracing paper, stencils for outlining the rooms, diagrams for tracing all kinds of furniture, doors and appliances into the rooms, colored pencils for coloring the furniture (we added in a bigger variety of colored pencils), and plexiglass walls of all sizes, along with the cubes to connect them and keep them standing upright, which creates the 3D effect, as is seen at the top of the blog post. When we had our blizzard last week, she took out her kit and finished up coloring in her furniture and began placing the cubes in the corners of each room so that she could put up her walls. Her house plan currently looks just as the photo shows it at the top of this blog post. I couldn’t be more proud, and more amazed at her work, at the level of the complexity of her thinking, and at her talent. The only step she really has left is to use the included removable decals to add in windows and doors on the walls of her rooms. We can’t wait to see the finished product, and I think she’s already looking forward to having it on display for a little while and then taking it all apart in order to start all over again. Thankfully there are six pieces of tracing paper in the kit so that she can do up to six different house designs before I have to find more paper for her. 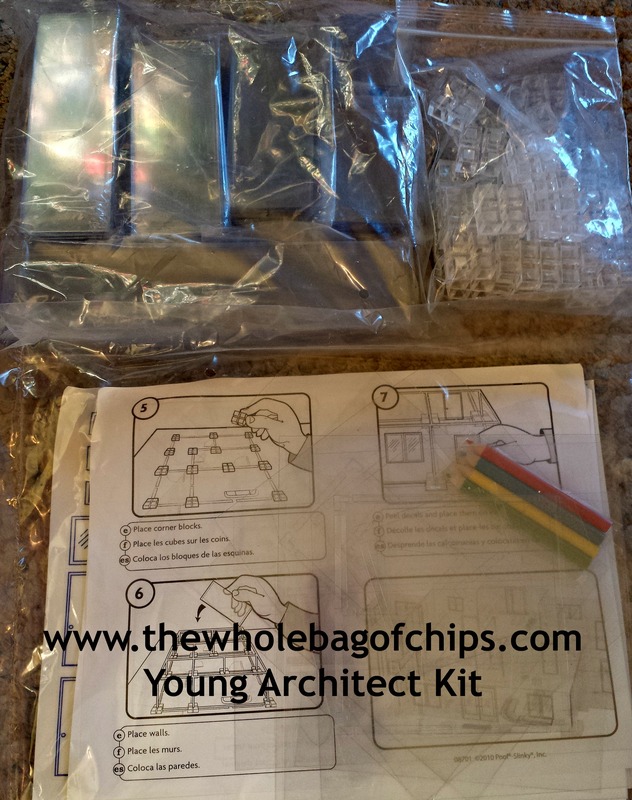 I’d highly recommend this Alex Young Architect design kit for all your aspiring young architects and engineers whether they are boys are girls. The kit is moderately priced, and is well stocked with everything they need for hours and hours of creating and designing. It’s been a perfect, perfect STEAM gift for our aspiring female architectural engineer, and I can’t wait to see what she creates next. Freaky, yes. Educational? Who knew? Have you seen them? Have you seen the Monster High dolls yet? They are bizarre-looking, zombie-like dolls, about the size and shape of a Barbie doll, but clearly *not* a Barbie. My younger kids love them. They have lots of them. The Monster High dolls room with their Ever After High dolls downstairs in the Barbie Dreamhouse, lounging by the pool together. The Monster High dolls have grey, green or blue skin colors (there might even be other skin colors, but these are the ones we have) and some really monster-ish features to them. They’re unique for sure, and we don’t discriminate on skin color at our house, no matter what color it is. That in itself is a good lesson. 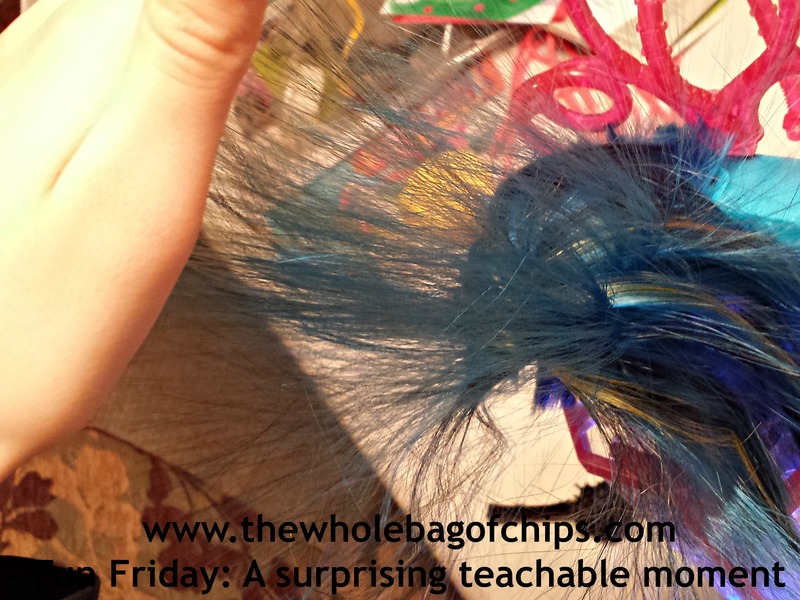 But whatever, not everything can be a stellar STEM/STEAM learning toy, right? Surprisingly, it can, and no one was more shocked by this fact than I was, believe me. Now clearly, we don’t have any kind of toy rule or anything, where every toy we buy has to be educational in nature, or STEM/STEAM related. 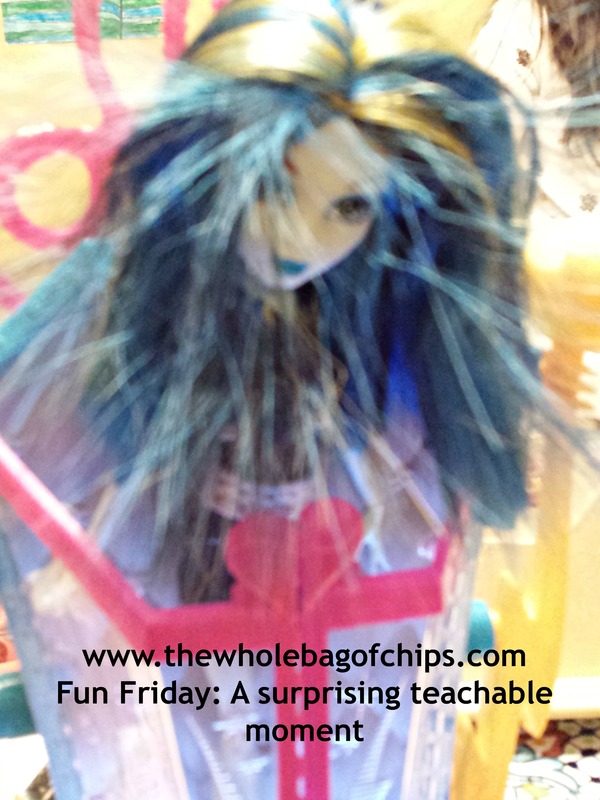 A toy can just be a toy, too, so I was shocked when it turned out that my daughter’s recent purchase of a Freaky Fusion Monster High doll, the newest in the Monster High collection, was found at Barnes and Noble Bookstore. Usually the bookstore sells, well…books. And devices, and learning toys. But a Monster High Freaky Fusion doll? That must’ve been a mistake. We do have a toy rule with our kids that leading up to the holidays they are not to use their own money to make any frivolous purchases. They need to wait until after the holidays, see what they’ve received, see what old toys need to be given to someone who will make good use of them, and only then can they take their money they’ve saved as well as any money they received as a gift for Christmas and then they can make some spending choices. 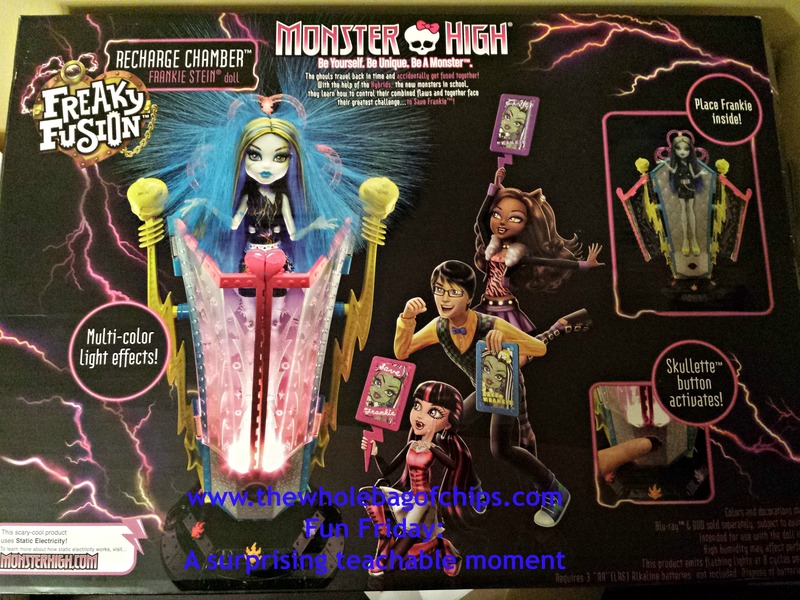 The day after Christmas, my youngest wanted to purchase one of the things that was not brought by Santa, and not given to her from anyone else: a Freaky Fusion doll and a Recharge Chamber. This is when we say, “It’s your money, you saved it and if this is how you want to spend it, that’s up to you.” Sometimes we hope they’ll reconsider and think that it’s a silly way to blow twenty bucks, or in this case almost $50, but it doesn’t always happen that way. To me though, the true-er lesson is a week or two later when they have nothing left in their spending money and they see something they like, but now can’t buy because they own whatever it was they so desperately “needed” two weeks prior. Financial responsibility…it’s a work in progress. They earn their money, they save it, they spend it, sometimes they’re happy they did, sometimes they wish they didn’t. It’s an on-going thing. 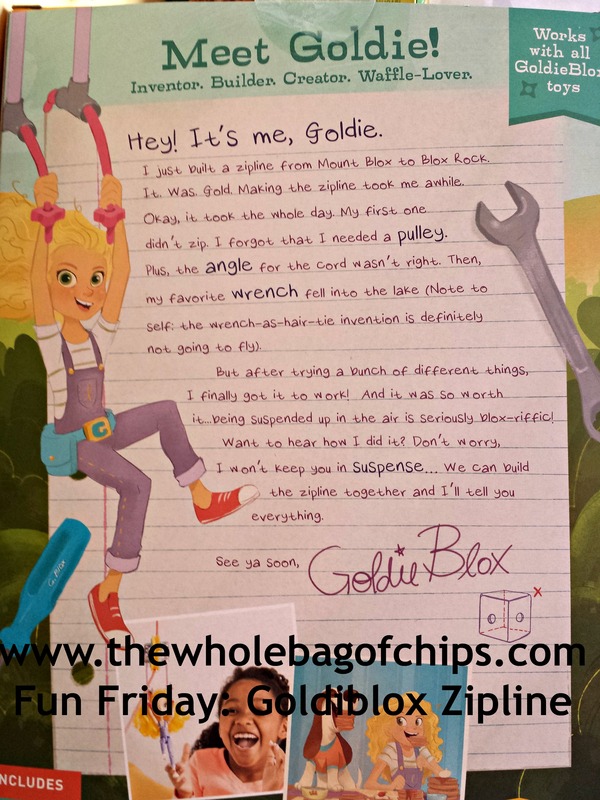 On December 27 we happened to be in Barnes and Noble looking for a different toy that was supposed to be educational for another daughter who desperately wanted it (and you’ll see that one on here next week). They didn’t have it, but lo and behold, there on the shelf was Frankie Stein and her Recharge Chamber. I just happened to have daughter #3’s money envelope in my pocketbook. We counted, we checked the price, and she had enough money. She didn’t want to shop around for a cheaper price or a better deal. She had the money, she wanted the doll, wanted the chamber and she got it. Well now….wait a minute, what’s that say? 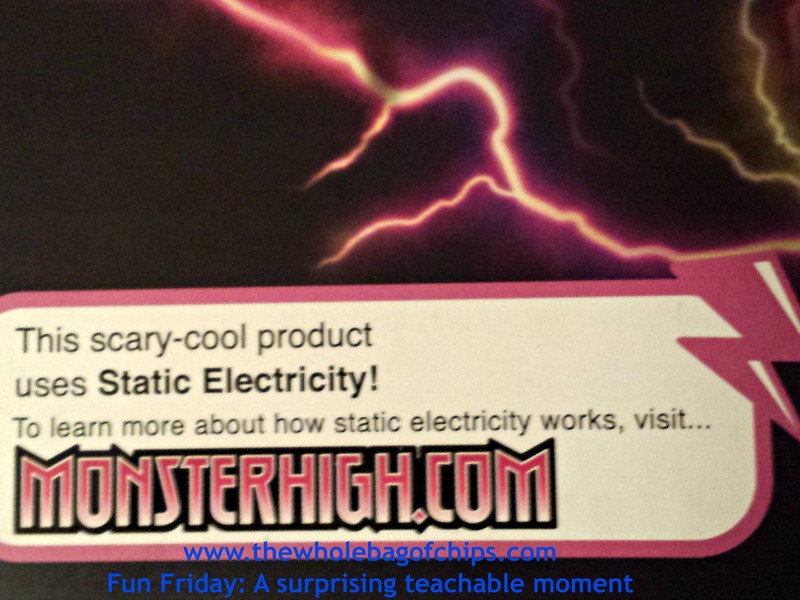 Imagine my surprise when I see the note on the box that talks about the fact that this toy employs the use of static electricity and then gives a spot on their website where the kids can go and watch some videos to learn more about static electricity! Well now…that’s kind of cool. Did I make her go home and immediately find the link, watch it and learn about static? No. By the time we got to the car, I was already on to the next thing, and I really didn’t care if this was a learning toy or not. That wasn’t my objective this time. Did she do it on her own, unbeknownst to me? Yes, and she actually learned something. I know this because later on, on a different day when she was playing with the toy at the dining room table, holding her hand up to the doll’s hair as it flew out all over the place from the static, she told me about the Recharge Chamber, and how it worked and what static was, and why. I must say, I was impressed, and surprised. Get it? It’s a static electricity pun! So…although this was not our goal, to buy a STEM doll of the Monster High Freaky Fusion sort, it turns out that we did. I say “we,” but really it was my daughter. She saved her money, chose what she wanted to buy, and chose an educational, unique toy and she was pretty happy with her choice. There’s nothing more rewarding than working on something mechanical and seeing it do what it’s supposed to do! As I’ve been mentioning over the past week or so during my post-holiday reviews, our over-arching theme for gifts this year was definitely a STEAM theme: Science, Technology, Engineering, Art, and Math. 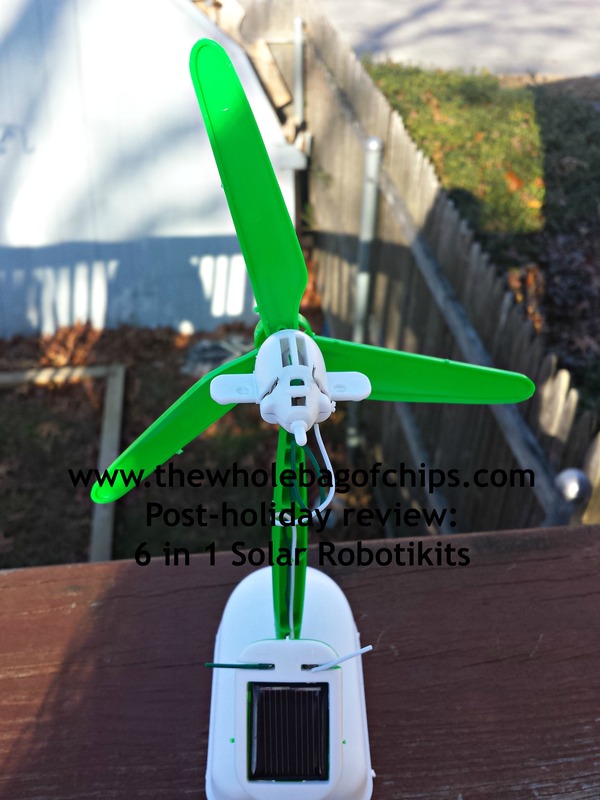 Today’s review is for the Robotikits 6 in 1 Educational Solar Kit. I know that we’ve often seen this kit in catalogs, especially the Mindwares catalog, and my kids have always thought it looked like a cool toy, but the kit we received from Santa this year was a less expensive kit, kind of an overstocks type of deal such as this one where you get the barebones supplies for a very low cost and your item is shipped to you just in a clear plastic bag with the supplies and directions enclosed. Not pretty in the packaging, but it’s very budget-friendly and you still have everything you need. I believe that this particular kit cost Santa less than $5.00. This kit allows you to use one gear box and one solar panel and 21 plastic pieces to create six different solar powered machines: a windmill, a dog, a revolving plane, an airboat, a car and a plane. 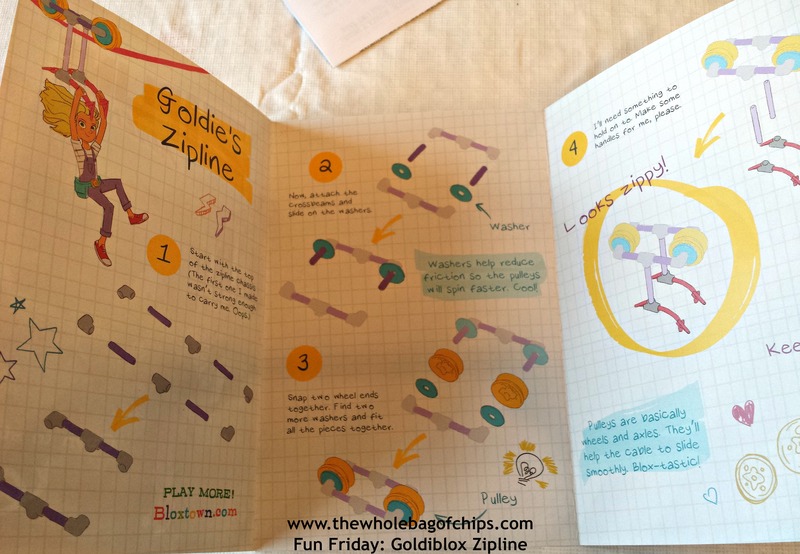 You can also use the pieces enclosed to try creating your own inventions. The kit is for ages 10 and up, and our 9 year old was on the receiving end. It was definitely not something that she could do on her own yet, and we had to end up calling Dad to the rescue due to some initial confusion on my part. But, they worked on the project she chose to be her first one, a windmill, and then took it outside in the sunshine to give it a try. Seeing her face light up when it began spinning was priceless. You can catch a quick glimpse of it spinning in this short YouTube video. Even I was amazed, watching it go. It was fascinating watching it stop as you moved it out of the direct sunlight and then go again when you moved it back into the direct sunlight. You can hear my amazement and a little bit of our discussion about direct sunlight vs. indirect sunlight in this short video. 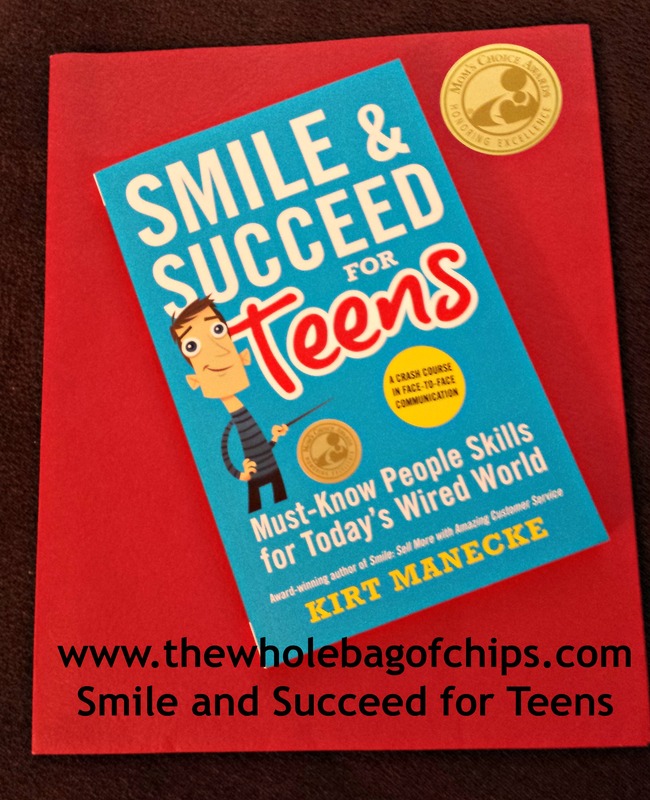 I think that projects that cause you to go outside of your comfort zone, that allow parents and kids to problem-solve together, and that produce a tangible result are great. This is one of those gifts. For now, our daughter’s windmill is proudly displayed in her bedroom, but she’ll eventually change it up and choose another solar powered machine to create. She may need some help with it, but she’s learning great hands-on lessons about the mechanics of solar power, and I think she’s really loving her gift. I would definitely recommend this gift, and whether you choose to go with pretty packaging or bare bones, I think you’ll be pleased with the product itself. It’s been a great learning experience for all of our daughters.